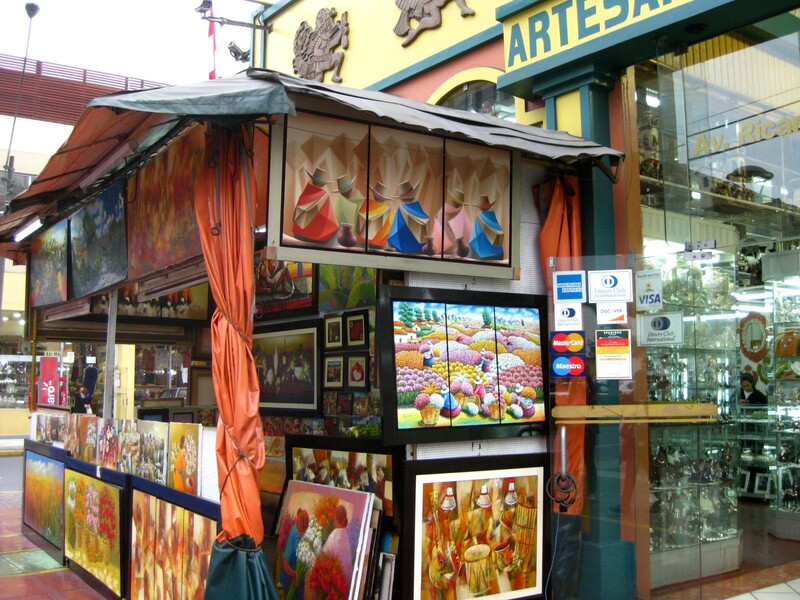 Stands like this one, with paintings ranging from representations of Andean farms to religious symbols, are all around our neighborhood, Miraflores. This weekend I bought a painting. I hadn’t gone out intending to do so, but in the middle of Parque Kennedy, where local artists set up their displays every weekend, I found myself talked into an impulse buy in the most pleasant way possibe. The painter, Hermán, was a round-faced man in his twenties or thirties who was already talking to two of the other girls on the BU program when a friend and I showed up in the park. His paintings sat on a wooden frame, some protected by a plastic sheet from the rain that had been falling all day (this was Lima’s version of a punishing downpour, meaning that after walking around outside for half an hour, my hair was slightly damp). One after another, the other girls selected paintings, none of which cost more than 20 soles – $7.63 in U.S. dollars. All the while, Hermán was telling us about Peruvian foods we should try (the one I made sure to remember was the picaron, a sort of donut made from squash and sweet potatoes) and asking us where we were going after we left Lima. Rather than harassing us to buy something or pushing us toward one painting or another, he told us about the towns we’d be visiting and asked us how we were finding the capital so far. 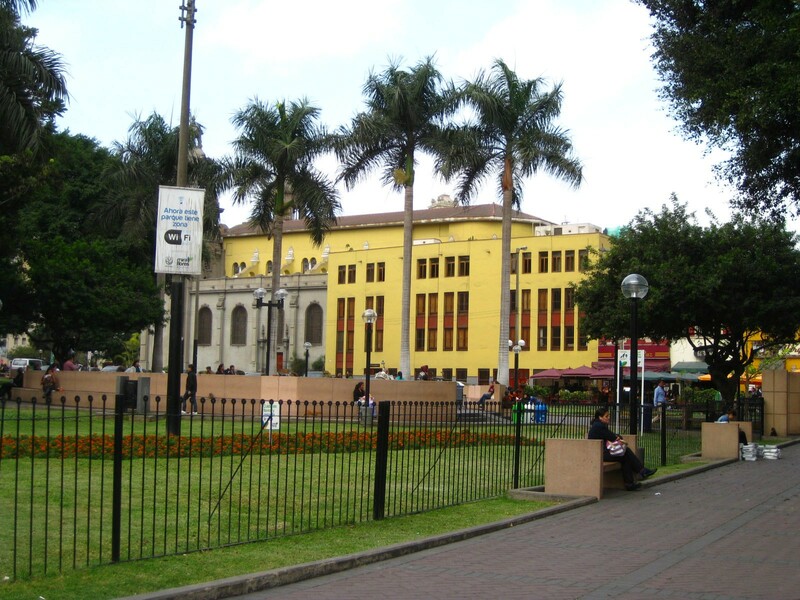 Parque Kennedy, one of the many green areas in the city, is populated by artists, markets, and also a number of stray cats. The weather here – at times simultaneously chilly and humid, with gray skies from sunup to sundown – can take a toll on morale. So can the fact that rapid-fire Spanish, in conversation with native speakers, is still far from natural for me. It’s fortunate, then, that nearly everyone I’ve met in Lima has been exceedingly friendly. Our group of “amigos,” the university students who volunteered to show us around the city, have done everything from finding us soccer tickets to getting us “on the list” at various bars and discotecas around town (if you’ve never been “on the list,” I recommend it – no matter where you are, it makes you feel sort of like Beyonce). I’ve had a few random strangers approach me for conversations that wound up being much longer than I expected (don’t worry, these were in a well-lit, populated areas). So when I was the last one left without a purchase, I went ahead and pointed to the one I’d been eyeing, an oil painting of two small Peruvian houses covered in colorful flowers. There may have been bigger, more impressive paintings in the tourist-geared “Inka Markets” that line a number of nearby Miraflores streets, but this one came from the person who told us about picarones and somehow stayed cheerful while standing in the rain all day with his work.